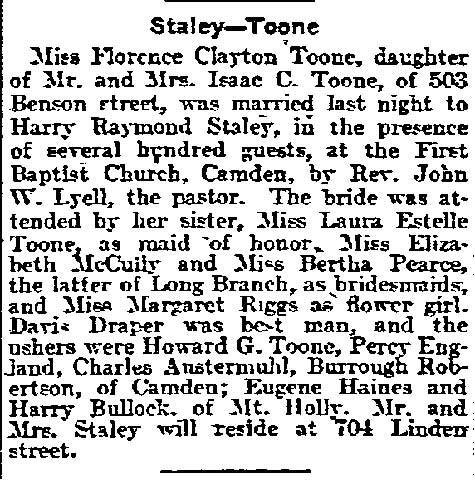 HARRY RAYMOND STALEY was born in New Jersey around 1880. He married his wife, Florence, about 1905. By 1905 the Staleys were living at 704 Linden Street in Camden. H. Raymond Staley was operating his own business, selling cabinet safes. 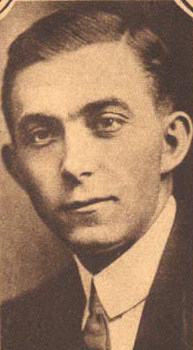 He was involved with several business and civic groups, and in the early 1920s was active in the fund raising drive that culminated in the building of the Walt Whitman Hotel at Broadway and Cooper Street. 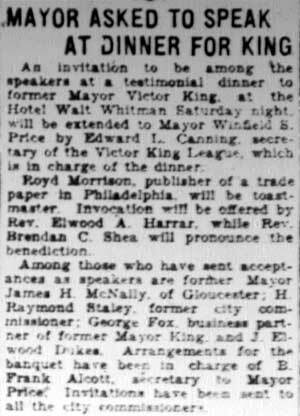 H. Raymond Staley was elected to Camden's Board of Commissioners as a Republican in May of 1923, and served for four years as Director of Parks and Property, during the administration of Mayor Victor King. He served one term, stepping down in May of 1927. The 1930 census shoes H. Raymond Staley as being retired. Mr. and Mrs. Staley were still living at 704 Linden Street in Camden. Although only 49 years old at the time of the census, he listed his occupation as retired. Mrs. H. Raymond Staley of 704 Linden Street, has left for Buckhill Falls, in the Poconos, where she will be registered at the Inn until October. .